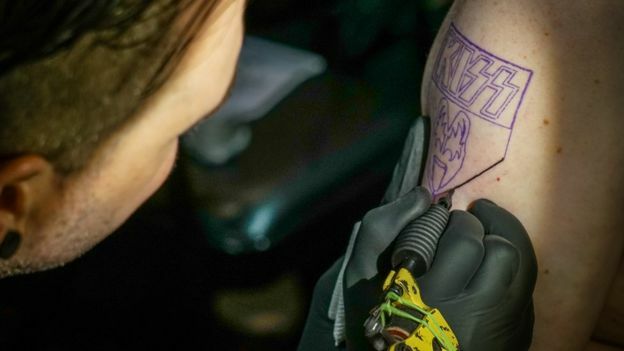 Not content with filling stadiums around the world, and selling more than 100 million records, the face-painted, fire-breathing US hard rockers also have their own navy.Show-stopping rock band Kiss were always going to go the extra – nautical – mile. Every autumn Kiss hire a huge cruise liner to sail around the Caribbean for a week with 2,300 of their diehard fans. This year will be their sixth voyage, or Kiss Kruise VI. 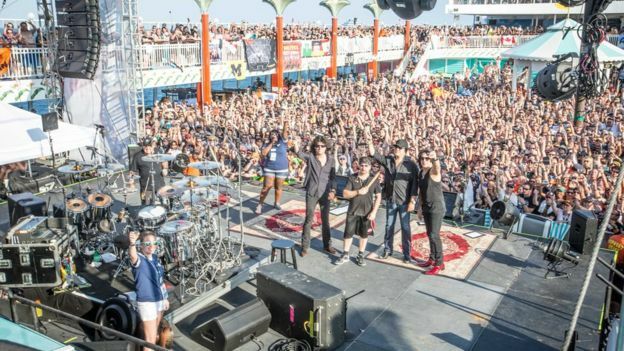 The band perform two shows on the ship, and fans get to meet and hang out with the four band members. 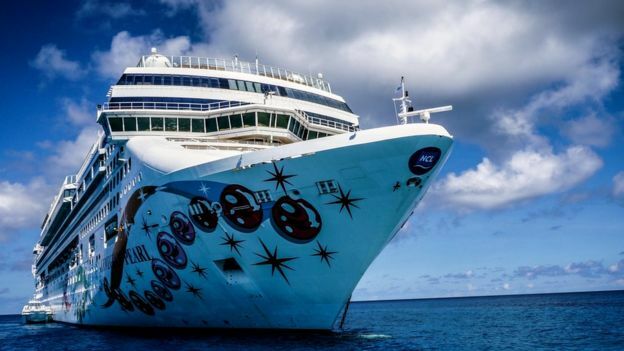 There are 13 bars on board, plus 12 restaurants, a swimming pool, a gym, a spa, a casino, an indoor theatre and a tattoo parlour for getting a new Kiss ink work. 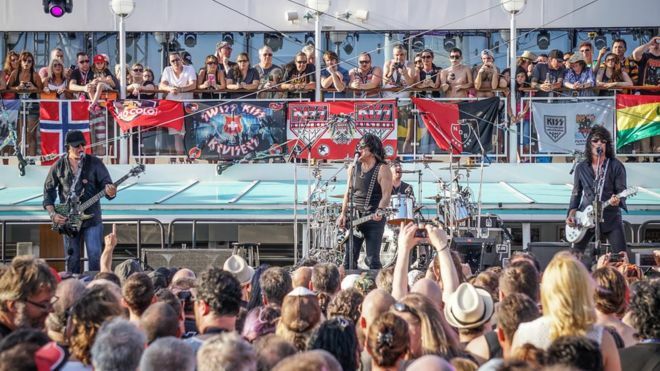 Members of the so-called Kiss Navy fly into Miami from around the world to attend, and Kiss vocalist and bass guitarist Gene Simmons says the cruise is one of the highlights of his annual calendar. “It’s rock and roll all night and party every day,” he says. “Anyone who has ever been on one of our cruises comes back raving to their friends. While Kiss might not be to everyone’s taste, the rock group has helped to transform the once staid world of cruise lines. Whereas cruises were traditionally the preserve of elderly holidaymakers, over the past decade – and especially in the past five years – there has been an exponential growth in the number of “themed cruises” – cruises aimed at people with a specific interest. 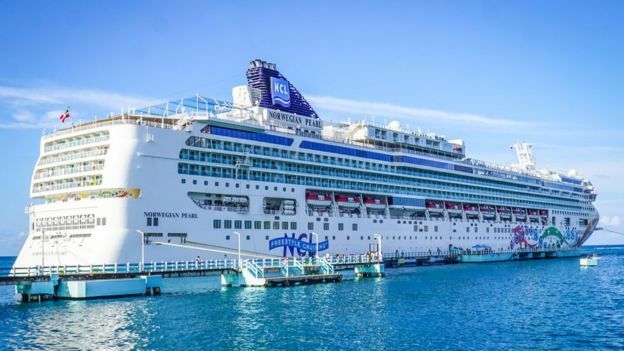 This has opened up the world of cruising to a much younger demographic, and given the cruise industry hundreds of millions of dollars in additional earnings. From music cruises – at which Kiss are leading the way – to cruises for people with specific political views, or cruises for poker players, or fans of Italian food, there is a ship sailing for pretty much everyone. For example, if you are passionate about your constitutional right to bear arms, you might be tempted to join the Freedom Alliance and National Rifle Association’s cruise down the River Danube in June. Guest speakers include US Republican politician – and former speaker of the US House of Representatives – Newt Gingrich. Or if you are transgender, Transgender Vacations organises cruises around the Caribbean. Disney holds regular sailings for fans of the Star Wars movies, where you can dress up as a stormtrooper or ewok and meet some of the actors. Howard Moses, founder and president of the Cruise & Vacation Authority, says that more than 700 themed cruises now set sail around the world each year, compared with less than 30 a decade ago. “Themed cruises are absolutely by far the biggest growth area in the industry,” says Mr Moses, whose organisation is based in the US state of Georgia. “It has enabled the cruise industry to reach beyond people who are our traditional customers, to people who are passionate about a certain subject. 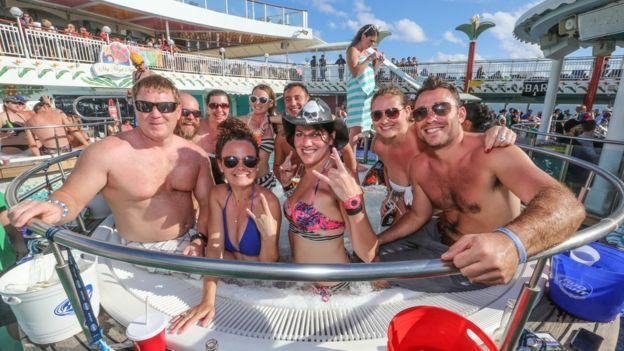 “For music cruises, there can be a very young crowd. At Atlanta-based Sixthman, the world’s largest organiser of music cruises, its communications manager Alaidriale Derway says the business has just wrapped up its busiest ever spring sailing season, with 10 back-to-back cruises. 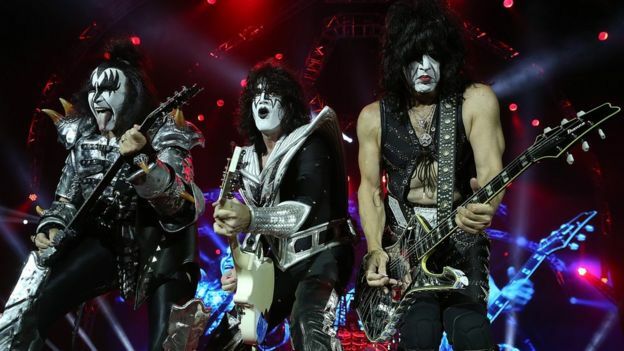 Sixthman now has more than 500 acts on its books, including Kiss. 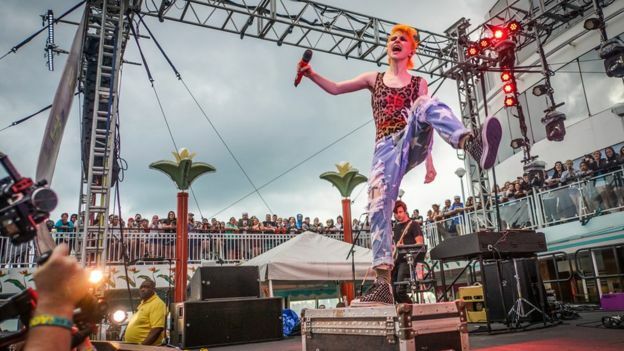 Other acts for whom it organises cruises include Weezer, Paramore, Lynyrd Skynyrd and Kid Rock. The company charters the ships and helps to organise support acts. Ms Derway says: “More and more artists want to get involved. “Cruises are a great way for artists to interact with their fans in a much more intimate environment, and collaborate with each other. While the music cruise industry is very much based in the US, themed cruises are also a growing phenomenon on the other side of the Atlantic. Mike Bugsgang, chief executive of the UK-based Association of Group Travel Organisers, says there has been a big rise in the number of cruises that include visits to locations that have featured in well-known movies. One such cruise organised by Fred Olsen Cruise Lines is called “UK Scenes from the Silver Screen”. 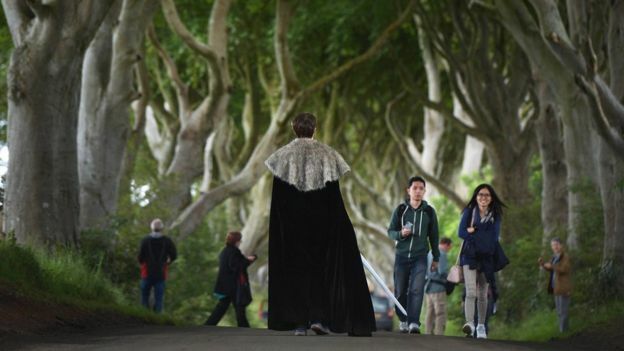 Sailing around the UK and Ireland, the itinerary includes trips to settings from TV series Game of Thrones and the Harry Potter movies. 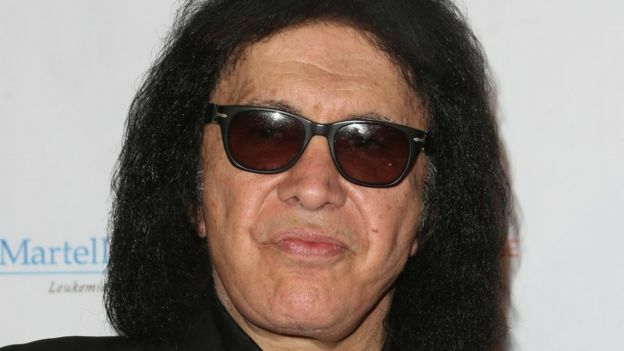 Back in the US, Kiss’ Gene Simmons doesn’t just have to prepare for performing live on the Kiss Kruise, he also has to brush up on his wedding officiating. An on-board extra for Kiss’ hard-partying fans is the chance to splice more than just the mainbrace. They can tie the marital knot, with Mr Simmons or a fellow band member performing the service. But one thing a Kiss Kruise is not is restful. SHANGHAI — David Herrera, president of Norwegian Cruise Line Holdings’ China operations, revealed some of the features that will debut on the Norwegian Joy, a ship being built for the Chinese market. Herrera made the announcement here during a keynote address at Travel Weekly’s CruiseWorld China. Although Joy is a sister ship to the Escape, it will offer several “first-at-sea” features related to activities, hotel, service and gaming. Some attractions — a formal tea room and an upper-deck Serenity Park — are what one might expect on a ship built for Chinese guests. Guests can ride hover craft bumper cars at the Galaxy Pavilion. Autos are also front-and-center in a Formula 1 attraction. Race cars have been converted into individual three-screen simulators displaying famous race tracks from around the world. Deck 16 activities will include Oculus virtual reality technology in several variations, including walking a plank between buildings, hang gliding and a design-your-own roller coaster module. Oculus technology will be installed on additional new ships going forward, Herrera said. Motion simulation will be the attraction in a colorful fleet of Star Wars Battle Pods. 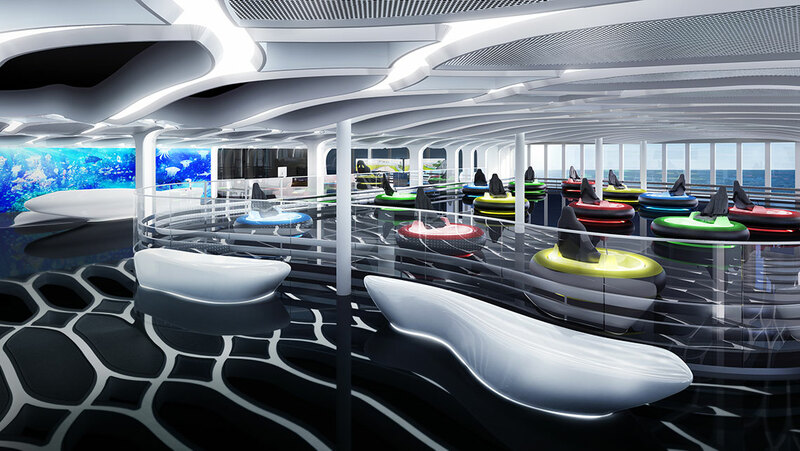 Laser tag, a giant touch screen for young children, hovercraft bumper cars, wider-than-ever waterslides with transparent panels that go over the side of the ship and several karaoke rooms complete the new activities offerings. On the hotel side, a new level called Concierge will be built above the Haven. 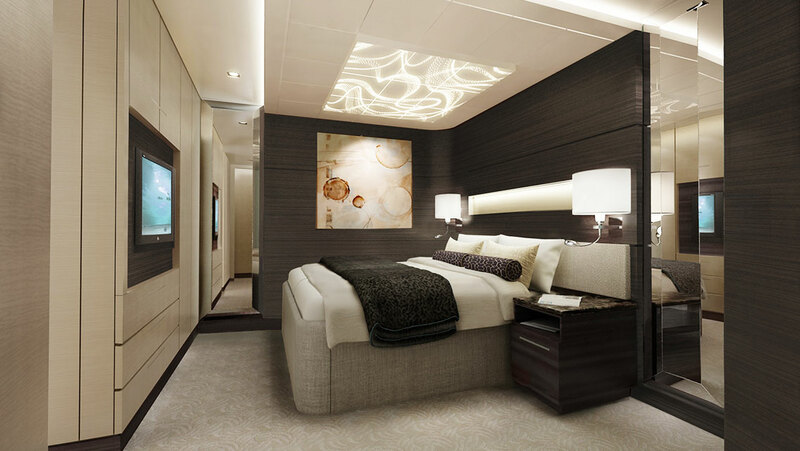 It will not be as luxurious as the Haven but will have unique features, including a new suite class with two bedrooms and a simulated balcony. The ship will feature many more family friendly suites and rooms with connecting doors than on any previous NCL ship, Herrera said. He added that the new room configurations reflect the Chinese tendency to travel with multiple generations. Studio cabins for singles, a feature of every NCL ship since the Epic, will not be on the Joy. 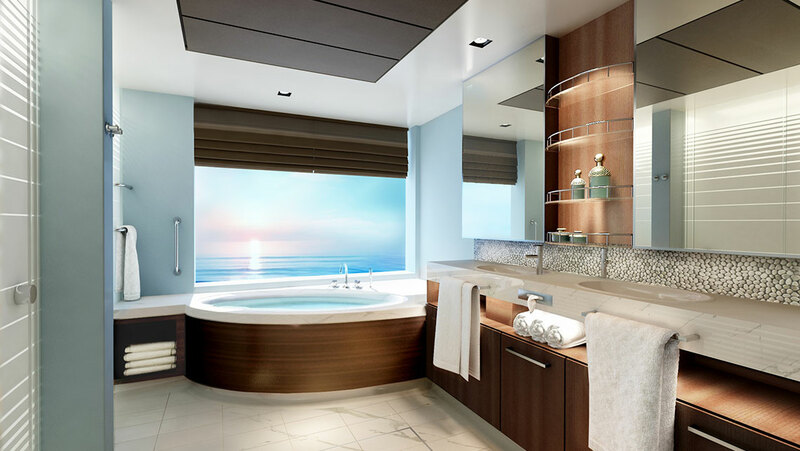 A bathroom in a Concierge suite. The ship will, however, feature the highest crew-to-passenger ratio of any contemporary-class ship, in part because it will carry 250 fewer passengers than the Escape. (Herrera said that additional staff was also hired.) The space occupied by some cabins that had been on the Escape has been given to the casino and shopping areas. The 29 restaurants onboard will include one for Korean barbecue as well as a Japanese shabu-shabu restaurant. Herrera declined to say how many of the restaurants will be specialty dining requiring a surcharge. “It’s about bringing best of east and west together,” Herrera said, summing up all the changes. More details will be announced in the coming months, he added, including the names of luxury store brands. The characters for the word “Joy” represent “Inner Joy,” Sommer said. The Norwegian Joy is due to enter service in summer 2017. Disney add Extra Star Wars Days. Disney Cruise Line said it will nearly double the number of Star Wars Days at Sea when it expands the event in early 2017. This year there were eight Star Wars Days scheduled on the Disney Fantasy on eastern Caribbean itineraries. The days feature appearances of Star Wars characters; a deck party and fireworks; Star Wars-themed family and youth activities; at-sea screenings of Star Wars films; and themed food, drink and merchandise. Next year, the concept will be expanded to western Caribbean itineraries and there will be 15 Star Wars Days. Departure dates for cruises are: Jan. 7, 14, 21, 28; Feb. 4, 11, 18, 25; March 4, 11, 18, 25; and April 1, 8 and 15.